12 Hours Of Nevers Magny-Cours – FIM European Cup Bike Endurance Race. French Superbike and Supermotard Championships – The French Championships, using dirt and tarmac tracks ! French FFSA GT Championship – GT4 France – Great names and spectacular cars. Autres événements – You want more ? M-1 to the return of the Truck Grand Prix! 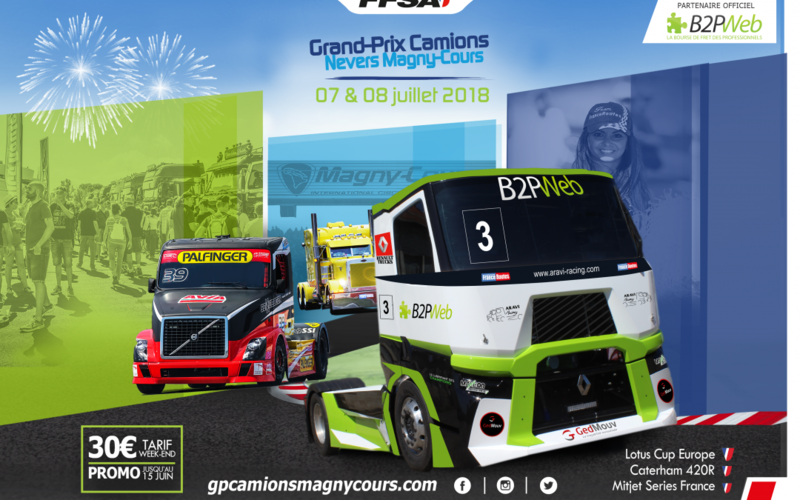 You were waiting for it, and it will finally be back after 4 years of absence… The Nevers Magny-Cours Truck Grand Prix! Yes, the trucks will once again invade the track for your delight and enjoyment. With races and entertainment, your weekend will be full of exciting sensations! Food trucks, a mechanical bull, a DJ evening, the firemen’s village, Country and Zumba dancing, exhibitions, radio controlled trucks, a funfair, inflatables, Mountain E-Park bikes, and not forgetting the essential Trucks show with all the decorated trucks… There is certain to be something for everyone, big and small! French Truck Championship: 4 races over two days. European Lotus Cup: 3 races over two days. Caterham R420: 2 races over two days. French Mitjet Series: 3 races over two days. We’re looking forward to seeing you on the 7 & 8 July at the Circuit of Nevers Magny-Cours!